SIOUX FALLS, S.D. 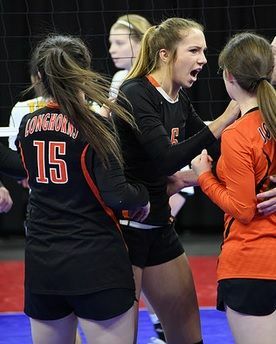 - There was plenty of excitement at the Class B Tournament, where Faith came back in the fourth set to force a fifth deciding set against Faulkton. Faulkton was up 24-14, needing just one point to win the set and the match. But, Faith would not be denied – scoring 12 straight points to win the set 24-26 and force a fifth deciding set. Both teams battled in the fifth, but the momentum for Faith was too great, and the Lady Longhorns pulled off the remarkable comeback to take the match with a 15-11 set five win. Jayden Shoemaker had 20 digs to lead Faith with Brooklyn Hanson and Sydnie Schauer each adding 17. Shianne Price had 12 kills for Faith.